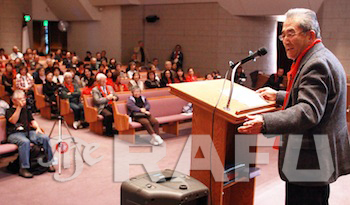 More than 200 attend "speak out" session at Centenary UMC. Norman Mineta added his voice on Saturday to those seeking to stop the impending sale of Keiro’s four senior care facilities. 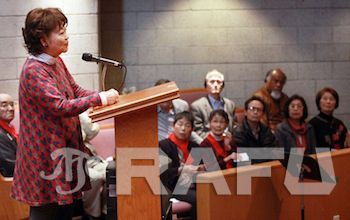 The former U.S. transportation secretary was in Little Tokyo to chair a meeting of the Japanese American National Museum Board of Trustees, but stopped by briefly at a “speak out” meeting held at Centenary United Methodist Church to express his feelings on Keiro. “I am proud to be with all of you today and proud to join you in speaking out to save Keiro,” Mineta said at the event sponsored by the Ad Hoc Committee to Save Keiro. He explained that he was briefed on the issue by Jonathan Kaji, a leader of the Ad Hoc Committee and a member of the JANM Board of Trustees. “Listening to Jonathan about the process that went on in this issue. The question of what did the community know about why this was being done, more importantly to the residents of Keiro as to why this was being done. And there just didn’t seem to be a good plausible explanation for the closure of Keiro,” Mineta stated. Keiro Senior HealthCare, citing changing demographics in the Japanese American community and declining occupancy rates, has stated that the sale is necessary in order to preserve the current standard of care for current and future residents. Another round of mediation talks between Keiro, the Ad Hoc Committee, the Attorney General’s Office and the Department of Fair Employment and Housing are scheduled for Wednesday. Mineta said that he had spoken with Rep. Judy Chu (D-Pasadena) that morning and that he would be contacting Attorney General Kamala Harris. He also said he would be reaching out to members of the Keiro board. Mineta, who served in the Bush and Clinton cabinets, is the highest- profile Japanese American leader to lend support to efforts to halt the sale of the Keiro facilities to Pacifica Companies. The “speak out session” was organized to give community members an opportunity to voice their opinions about the Keiro sale. Centenary’s social hall was opened so attendees could write out their thoughts prior to the start of the open-mic session. Members of the audience wore red in support of the Ad Hoc Committee to Save Keiro. Traci Imamura, an organizer of the “speak out,” said that 164 responses were received and the Ad Hoc Committee is now working to translate the materials into English and Japanese. “We wanted to give the people the opportunity to tell both the attorney general and Keiro, as well as the Ad Hoc Committee, what they thought about the sale and what they want to happen,” Imamura said. At the “speak out” session, former Assemblymember Warren Furutani, currently running for State Senate, was among 25 speakers who expressed their reasons for opposing the sale. Others who spoke included Keiro co-founder Frank Omatsu, Hideki Obayashi, activist Mark Masaoka, make-up artist Kaori Nara Turner and Shinkichi Koyama of the Southern California Gardeners’ Federation. Deputy Attorney General Robert Sumner also attended on behalf of the Attorney General’s Office. Shinkichi Koyama, a member of the Southern California Gardeners’ Federation, addresses the gathering. 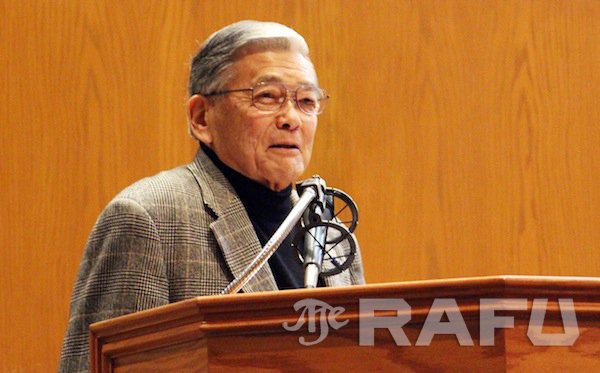 In an interview with The Rafu, Furutani acknowledged earlier remarks by Dr. Takeshi Matsumoto criticizing Japanese American politicians for not supporting the “save Keiro” efforts. Furutani has attended several community forums on Keiro, including early meetings held in the summer at Dr. Kenji Irie’s office. “When Dr. Matsumoto called out the JA politicians, I said, ‘Hmmm, who is he talking about? There’s only a couple of us, so must have been me.’ So I said I better do something,” Furutani stated. 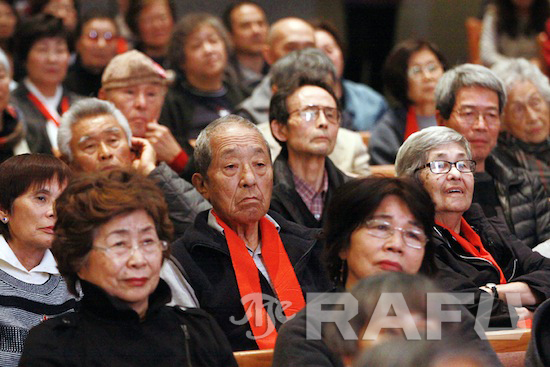 Furutani noted that because there are no Japanese Americans currently in the State Legislature, the JA community must seek out allies such as Rep. Chu and Rep. Maxine Waters. “The whole thing about politics is leverage. You have to have people with standing to have leverage,” he said.